Sandbox Studios works with museums to plan, create, manage and assess education programs and technology projects. With over thirty years' combined experience as museum professionals and independent consultants, Sandbox Studios staff have created everything from classroom materials to Web portals encompassing multi-museum collections. Sandbox Studios creatively applies tested technologies and innovative educational strategies to bring museum collections and people together. 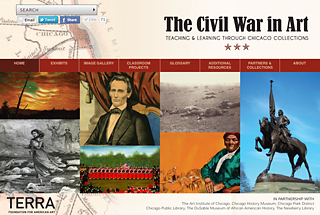 Teaching & Learning through Chicago Collections, an Omeka driven site intended to help teachers and students learn about the Civil War, its causes and effects, and connect to the issues, events, and people of the era through works of art. Developed for the Terra Foundation for American Art in partnership with The Art Institute of Chicago, Chicago History Museum, Chicago Park District Chicago Public Library, The DuSable Museum of African American History, The Newberry Library.